A record track listing, cut and pasted, is usually an easy way to fill up space in a blog, download or review, sometimes that is all there is. It is cited here for a different purpose. Cast your eyes over the titles and ask “I’ve got all these titles , why do I need this record, another Monk record? ” As if someone offered you the Mona Lisa and you turned it down saying No thanks, I’ve already seen it. Monk’s entire body of work consists of only around sixty songs.But what tunes! Fearsomely original quirky compositions, which become grooves drilled permanently inside your head. Like many others, Coming on the Hudson has a “wicked little riff”. I am happy to hear them all, over and over again. When I first listened to Monk, perhaps like many people, I found him a little “odd”. One critic at the time said Monk’s music was “like missing the bottom step in the dark.” Since I “got” Monk, I find everyone else a little “odd”. 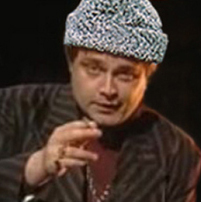 Not really, of course, but you hear what I’m sayin’? I also discovered there is no bottom step. 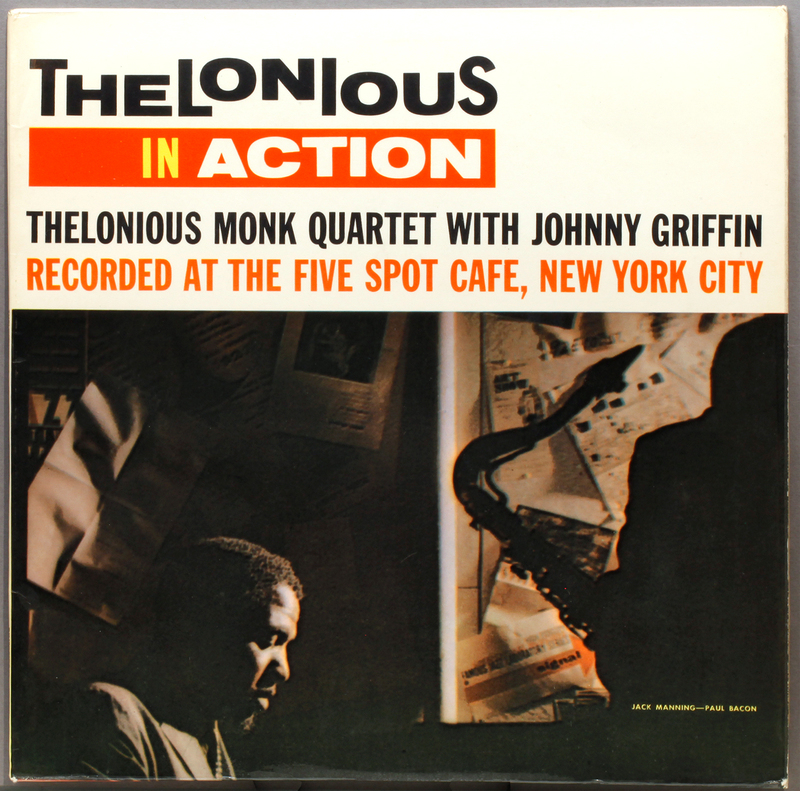 This live outing at The Five Spot features Johnny Griffin on tenor, who gives it the Chicago tough tenor treatment, a different approach to Charlie Rouse – who always seems more “in tune” with Monk, if that isn’t an oxymoron. I happen to like Griffin’s runaway express train delivery, and in the ten minutes of Coming On The Hudson there is plenty of it. Oh, Oh. I feel a mixed metaphor coming on, The Hudson’s a river isn’t it. Great! Wook wook. UK original release, pressing by Decca, New Malden, Britain’s answer to New Jersey. Immaculate cover, and possibly even “rare”. Somewhere in the early 60’s Riverside UK switched pressing from Decca to Phillips, who are fine but not as good as Decca. However both hold up very favourably with my few US Riverside pressings. As an aside, Riverside engineer Ray Dowler is an unfamiliar name. It must be said he does not come up to the standard achieved by some live recordings even at this early date: a few microphones short of the full Van Gelder I would say, but passable.. Source: North London’s premiere pre-owned record store. In some record shops they delight in telling you about a great record they had in recently but someone else came in and bought it yesterday, so its gone. Great! I’m really pleased for them! What they should of course say is how fortunate that you came in today, as some really great records have come in this morning, and would you like to be the first person to see them before they go out on the shelf? That’s more like it. That is exactly how it happened when I acquired a six-eye original copy of Kind of Blue the other week. A story for another day. 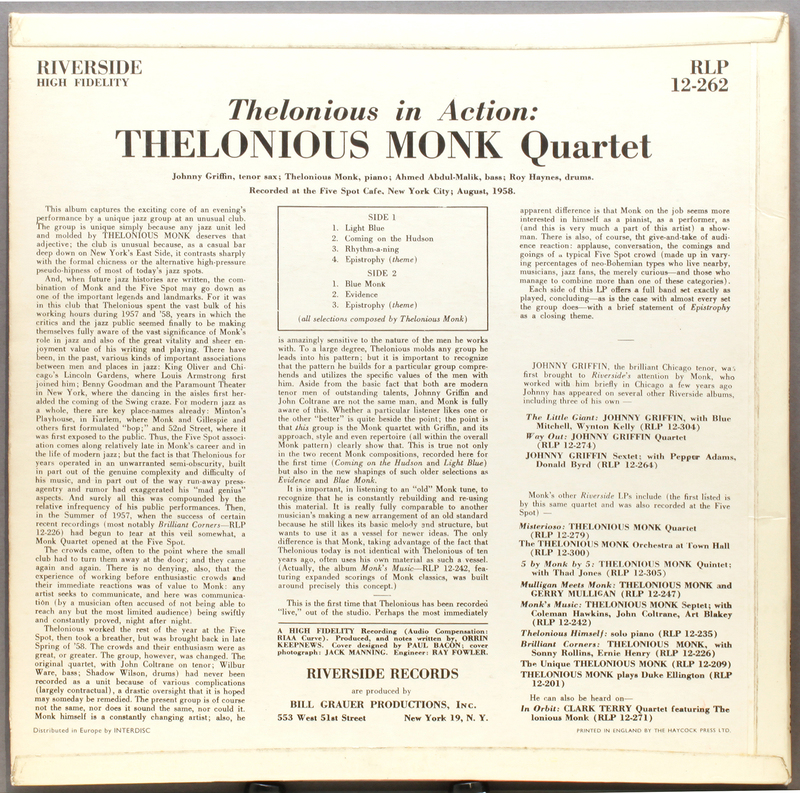 This entry was posted in Riverside, Thelonius Monk and tagged Ahmed Abdul-malik, Johnny Griffin, Riverside, Roy Haynes, Thelonious Monk by LondonJazzCollector. Bookmark the permalink. Monk was my second great jazz discovery after Bird, never looked back, his work brings tears to my eyes, can’t have enough of it.